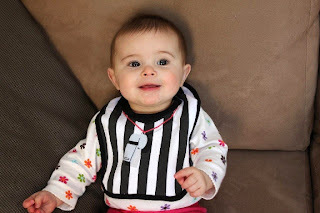 Embelle Fashion Bibs Available at Target + a Coupon! Most moms would agree, you can never have too many bibs. I myself have half a drawer full of them! I can also tell you that I don't own a single solid colored, regular bib. They all have cute sayings, adorable images, etc. Why buy a boring bib when you can make a fun fashion statement?! I haven't heard of Embelle bibs until recently, but am glad to find out that they are now available at select Target stores. They are made of pre-washed 100% cotton and come in a bunch of super fun designs that will definitely draw some "Awwws" when you're out in public. You can see the entire line of products at their website (I especially love the cat and dog bibs!) and stay up-to-date on new designs and promotions on their Facebook page. Don't forget to print the coupon! This is a sponsored post through Global Influence and I was compensated. All opinions expressed are 100% mine.